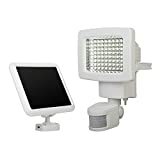 With the best motion sensor night light installed in the right place, you will have an automated, hands-free protection and illumination for your home. 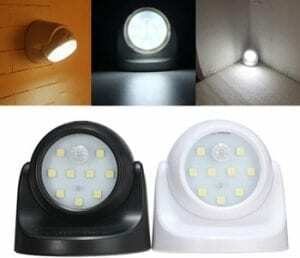 Whether used indoor or outdoor, you will find such lights very convenient. For instance, the light will come on whenever you pull into your driveway illuminating your surroundings. If you place it in the right spot, these night lights can also help seniors reduce the risk of falls. Such handy devices will ensure your walk path is always lit and help you avoid obstacles (Source). To choose the best one, you need to consider such things as the brightness, range, detection range, power source, design and ease of installation of the light. 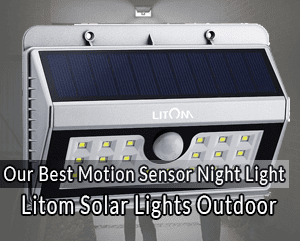 Get a bright light, energy efficient, eco-friendly and affordable LED motion-activated light with the Litom Solar light. This product offers an amazing luminosity of about 526 lumens. As a matter of fact, it is one of the brightest solar powered motion sensor outdoor lights available today. The product is availed in a 2-pack, featuring a wide-angle design. This ensures that you get a better coverage with this light. 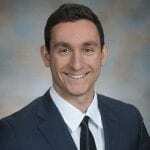 The fact that it is a wireless model makes it a relatively flexible option. As such, you may use it almost anywhere for outdoor illumination. What’s more, you do not even need to be connected to the grid to power this unit. The light features 3 main lighting modes, motion detection, and full-on and reduced lighting modes. Its unique design makes it ideal for an array of applications. For instance, you may use this light on your front or backdoor, driveway, garage, deck, fence, and balcony or even on a path in the compound. 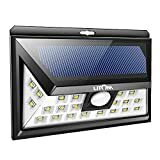 Offering a total of 200 Lumens in luminosity, the Solar Light URPOWER 2-IN-1 Solar Spotlight is a rather versatile motion-activated outdoor lighting option. In this regard, you can easily mount it on a wall or stick a pole to the ground and mount the light on it. The product features 4 LEDs and is powered by a 2200 mAh, rechargeable lithium-ion battery. Since it is specifically designed for use outdoor, this light is equipped with a waterproof case. While installing the light or afterwards, you will find it relatively easy to adjust it in accordance to different lighting needs. The eco-friendly outdoor lighting package features a compact design and is relatively easy to install. As a matter of fact, you do not need any tools to install it. Are you are looking for a motion sensor night light that is battery powered, but can offer a large coverage? You should get the Mr. Beams MB330 Wireless LED Spotlight right away. Although it is a battery-powered model, this product can illuminate about 350-Square Feet every time it comes on. 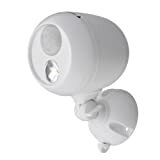 If you have been researching the market for a while, you probably are aware that Mr. Beams is one of the leading manufacturers of motion sensor night lights today. The MB330 is one of the products that clearly depict the precision and quality that the manufacturer is best known for. In addition to being an affordable and eco-friendly option, this light has an array of beneficial features to offer. To begin with, the unit is equipped with a powerful sensor; capable of picking movement from as far as 30 feet away. In a bid to preserve battery power, the light is designed to automatically shut off in 30 seconds intervals. The LED light itself is relatively bright, delivering up to 140 lumens. You will also love the fact that the wireless motion-activated light is easy to install. Simplicity, affordability and practicality are some of the aspects that make the Amir Motion Sensor Light one of the most sought after products in the market. With regards to construction, this light is mainly made of sturdy plastic. Additionally, it features a relatively bright LED bulb that has been proven to be energy efficient. The light comes with a long lasting rechargeable battery. You will also love the powerful sensor used in this product. The sensor is powerful enough to pick up motion from as far as 10 feet away. The bulb is triggered to come on by either motion or darkness. Once triggered, the light will remain on for about 25 seconds. The product is also compatible with an array of USB devices, including phone chargers, power banks and PCs. You will find this kit comparatively easy to install. 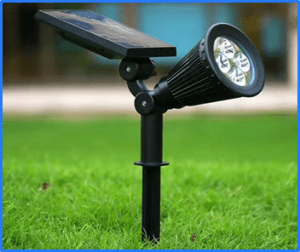 Get a solar-powered LED motion Light option that is customizable and relatively durable. 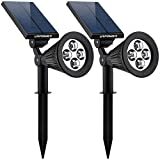 The Sunforce 82080 80-LED Solar Motion Light is one of the best products, in this regard. Being one of the most flexible options out there, this product allows you to customize the range and on time. In this regard, it comes with several settings. As for the distance settings, you can choose how sensitive you would like the sensor to be. This setting allows you to choose the distance at which you would like the sensor to pick up motion. For the distance range, you can choose high, medium or low range settings. Depending on your preferences, you can choose how long you would like the light to remain on from the three time settings. In this regard, you can choose any of the 3 time modes, including 120 sec, 60 sec and 30 sec. Are you looking for the best security light that saves on energy and is sure to scare intruders? You should consider buying the best motion sensor night light today. These lights feature integrated sensors that are triggered by motion below the light and cause it to come on. However, you must have realized that there are numerous sensor lights in the market. 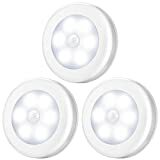 The various motion-activated LED lights available today are either wireless or plug-in models. The wireless models are battery powered, while the plug-in lights need to be plugged into an electricity source for them to work. Depending on the design of these products they may be suited for various indoor or outdoor applications. However, the choice of the right Motion sensor light requires much more than just these considerations. The detection zone in motion-activated lights is expressed in degrees and determines the area, within which the product can pick up motion. The larger the detection zone of a motion activated light, the larger the area it can cover. Most of the available motion sensor lights available today have a detection zone of between 120 and 270 degrees. However, there are some of the high end products that have a detection zone of 360 degrees. If you are looking for a product to install in a comparatively small space, such as a porch or the front door, you should get one whose sensors have a smaller detection zone. Ideally, a light with a detection zone of 90 degrees will be perfect for such an application. Just as is the case with conventional lights, you should get a motion activated light that produces a bright, clear and natural light. In this regard, you will find the modern LED motion sensor night lights better suited than traditional halogen bulbs. In addition to producing a lot of light, LED lights are loved for their energy efficiency. However, the right level of brightness for these lights will be determined by the intended application. If you will be using the product as the security light outside the house, you should go for the brighter 300 watts motion-activated lights. For decorative purposes, a less powerful light, such as a 150 watts motion-activated night light will do. From what distance can the motion sensors on your light pick up motion? Again, this will also depend on the intended application of the light. Basically, you need to go the high range motion sensor lights for outdoor application. For indoor applications, you may not need a high range. The range of a motion-activated night light partially affects its pricing. In this regard, you will find that the lights with a relatively high range, more than 70 feet, relatively expensive. If you are looking for affordability, you may have to settle for the products with a comparatively low range. The various motion sensor night lights available today come in an array of shapes and designs. When trying to figure out the right design for your new light, you should consider where you would like to use it. For instance, decorative lights are relatively more aesthetically appealing than the motion-activated security lights. As a rule of the thumb, it is advisable to choose a light that will complement the décor of your home. While most of the products available today are designed to be connected to the home wiring, not all run on electricity. Some are meant to be powered by solar panels, while others run on built-in rechargeable batteries. Depending on the source of energy of energy you have at your disposal, you need to choose the best suited product. If you are looking forward to saving money on the new installation, you may need to install the light on your own. In such a case, you should get a motion sensor night light that is relatively easy to install. If you are buying a replacement light, it is advisable to choose one that can work with the current fixtures. This will give you an easier time while installing the new light. If you are looking for a new motion-activated light for indoor or outdoor application, affordability is not the only way to go. As a matter of fact, you will realize that the cheaper options are of poor quality, are relatively less dependable and less durable. Instead, you should opt for the high quality, bright, easy to install lights with powerful sensors for an extended range. Regardless of your individual preferences, this guide will help you purchase the best motion sensor night light available today.